Why is it important for kids to learn how to save? If we teach kids how to save early, they’ll know how to manage their money more effectively as they get older. They’ll be more likely to grow up to live a life of financial freedom instead of a life of stress. Learning to save teaches kids to delay gratification which correlates with better life outcomes. See the famous Marshmallow Experiment. Learning to budget and save helps enforce an understanding of the real value of a dollar. Kids who save and set financial goals are more likely to be financially successful. Learning how to save teaches financial discipline and is the foundation of wealth. It must be taught and practiced early. People are increasingly responsible for their own retirement saving, so it’s more important than ever to learn to save and invest early. A simple truth: saving is a crucial life skill. What’s the best age to start teaching kids how to save? As soon as kids ask you to buy stuff at the check-out stand, they’re ready to learn about saving! Teach your kids to save as soon as they get their first cash gift and are old enough to understand they can use it for purchases. When your kids understand that money can buy stuff is when you teach them how to save money. That could be as young as 4 or 5. Some studies claim kids’ money habits are formed by age 7. See here. Start at birth! It is never too early. Just always make it age appropriate. There are teachable moments at every age. Age zero. Start saving for your kids until they understand. As soon as kids ask, seize the opportunity to talk about it. Get a piggy bank and USE IT. Take savings to a real bank. Pay for things with cash. Explain why you’re buying one item over another. Every transaction is learning opportunity. Should parents dictate how much kids save? Forcing kids to save could cause them to rebel. Try encouraging them and leading by example. Start early before they can rebel, then it will be a habit when they’re older. Use a softer influence with encouragement and explanation of future reward. I use 80-10-10 spend-save-give percentages for all ages. Always save 10% and you will always have money. Teach them, don’t tell. In the beginning, yes. But as the child grows and can make his/her own decisions, then not so much. Perhaps insist that kids do some saving, but let them pick the percentage after a thoughtful discussion. What techniques and tools can parents use to encourage kids to save? Help your kid set and achieve a specific goal, such as buying that new toy. Or save for a particular responsibility, like caring for a pet. Share a savings goal for a big purchase, like a new bike. Perhaps your child saves for half, and you pay for the other half. 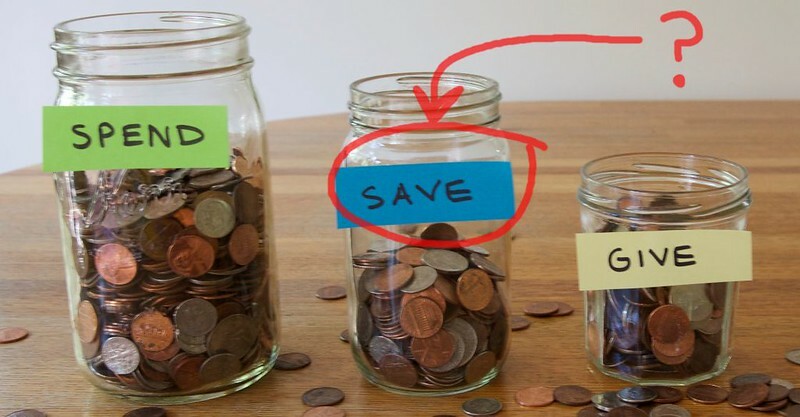 Use save/spend/donate jars, create savings goals together, and offer rewards for saving. I love the piggy banks that have a slot for spend, save, and give. Kids love piggies and seeing their money. Check out these fun games that teach kids about saving and money management. We have an app for that: The Centsables Dash For Cash. Automatically split allowance, chore, or odd job payments between spend/SAVE/give jars or accounts. Teach kids with envelopes for saving, spending, and giving. Talk about money they’ll need for future education. Parent matching is an effective savings incentive — especially, as kids get older. Use parent matching matching to simulate a 401(k) arrangement with your kids. They’ll be likely to participate in real 401(k) programs when they get their first jobs. Motivate kids to save with weekly parent-paid interest like @MrMoneyMustache does. Read about his technique in this great post: What I’m Teaching my Son about Money. Where should kids keep their savings? I’m old school. Take them to a bank. Show them a Safe Deposit Box. Open an Account. At first, start with a jar or piggy bank. Then take them to a bank, and show them the power of compound interest. Keeping a traditional savings account from an early age can really help establish the importance of saving. If you use a traditional savings account, consider sweetening the pot with parent-paid interest or matching. Our IOU and prepaid card accounts automate delivery of parent-paid savings interest. Once the jars are full, start a Credit Union savings account or a Roth IRA. A Roth IRA can be a good option since it can be drawn upon for educational expenses, not just retirement. Start tangible and gradually introduce your kids to the abstract concept of an online balance. Prepare your kids for the reality of the new digital world. Should kids have an emergency savings fund? I like a bit of a name change, especially for younger kids. EMERGENCY sounds scarier than needed. As a teen, a Rainy Day Fund is a good idea for sure. Once they start driving, they need an umbrella. This is when it really starts to rain on them. YES! Kids should absolutely understand the emergency fund concept and save for their own. It’s a key part of financial literacy! Kids should understand that savings should not just be for good things, but sometimes for not-so-good things too. Most kids aren’t faced with too many emergencies. But helping them to save in anticipation for things is a good start. Leslie, your kids must be angels!!! Mine, not so much. Broken windows from lax balls and hockey pucks, parking tickets, phone bill overages, broken phone screens, etc. Kids make lots of mistakes that they should have to pay for themselves, like breaking things when mad. Yes! Many teens do savings: I save up, until I spend it all, then I save up, then I spend it all. An Emergency Fund breaks that pattern. If we teach kids to have emergency funds early, we might make a big dent in future credit card debt levels! What are some big ticket items kids can save for? A tablet, a gaming system, and even ballet. Video games, iPad, special hobbies, etc. They need to learn how to budget, plan, and save. Kids can save for smartphones, tablets, gaming systems, clothes, shoes, vacation, etc. Computers or video game consoles, trendy clothes, smartphones. And if it breaks or doesn’t last, that’s a valuable lesson! My child saved a year’s worth of gift cards and bought a laptop for .46 cents! Mine started young and paid for their “stuff” — from BMX bikes to concerts... Now it’s cars, college, and rent. Even your 6 year old can start saving for college. Seriously! See how here. If they save for college, they will be more likely to go! 4 really big things your teen can save for are: emergencies, a car, college, and even... retirement! Related post here. When saving for big ticket items, consider the compromise technique: you cover the bare-bones cost of a no-frills version of the item, and your kid picks up anything over that amount if they want a fancier version. Don’t gamble on individual stocks. Diversify your investments over the long haul for the win. As Jack Bogel says: “The best way to own stocks is to own an index fund.” Index funds are a simple and effective way to get started with diversified investing at very low cost. This series of posts is a great place to start reading about investing. I like to teach my kids that, by owning stocks, they can be a part of the products they purchase. They love this idea. Teach kids that money can make money if saved and put in certain places. Yes, investing wisely and patiently will yield reasonable returns beyond the rate of inflation. Keeping your money in a mattress won’t. Inflation eats money. Kids should know how parents invest, in what and when. Parent-student openness about money is too important to neglect. Teens need to know that $100 invested per month in mutual funds from age 25-65 could net $1.7 million. When I show my teens a spreadsheet for their Roth IRA projections, they actually get excited. Imagine that. Kids should learn that investing is not just about money. They should invest in their education so they can learn how to grow money successfully. What are the best resources (books, sites, apps, games, etc.) for teaching kids to save? Parents should live by example. If children watch their parents saving and spending their money wisely, they will too. A great book with tips on teaching kids to save and invest is First National Bank of Dad by David Owen. Works for moms too despite the title! The best resource, whether it’s a book, game, or anything else, is the one a parent does consistently with the child. The New York Times bestseller The Opposite of Spoiled by Ron Lieber is filled with terrific tips for teaching kids about money. It emphasizes open communication. Games like stocks-game.com can help kids (and adults) have fun learning about investing in the stock market. If you’re a Dave Ramsey fan (and even if you aren’t), Smart Money Smart Kids by Dave and his daughter, Rachel Cruze, has excellent tips for teaching kids to save. Every teen should read The Richest Man in Babylon right before they read Shakespeare. We’ve compiled a list of 30+ online apps for helping parents teach kids to save and handle money. See here. For getting youngsters started with saving, we love the multiple jars like the ones from The Money Mammals and the multi-part piggy banks like the Money Savvy Pig. Our friends @PracticalMoney have several fun games to help kids develop financial skills. See here. Check out @SammyRabbit1’s programs for motivating kids to save here. Beth Kobliner, a personal finance author and a member of the President’s Advisory Council on Financial Capability for Young Americans, posts articles about kids and money here. Everyone should read Rich Dad Poor Dad by Robert Kiyosaki. We like Kids.gov’s resource page for kids and BALANCE’s online money course for teens. Pheww! Lot’s of great answers there. OK parents, no more excuses. Now you’re armed with all the answers you need to make sure your kids are part of that other 1 percent: the 1 percent of kids who actually save some of their allowance. Great post! My husband and I had a great idea that we would teach our son about money early on. Unfortunately, we've spent a lot more time teaching him to keep pennies out of his mouth than we have about savings. Maybe we'll start again in a year or two. Well Hannah, teaching your kids not to eat money - both literally and figuratively - is certainly a good start on the spending front. :-) Next stop: savings! Thanks for stopping by and leaving the nice comment.